A diamond ring, A Rolls-Royce, A Hasselblad camera. you automatically know what to buy. A unique Swedish gun for hunting and sport shooting. A shotgun made of stainless steel. Constructed by Rune Flodman, one of the most distinguished competiton shooters in Sweden. FLODMAN-a technical masterpiece which fulfills the highest demands for strength and precision in every detail. Already today Flodman belongs to tomorrow´s generation of shotguns. A precision gun in all it´s parts. As a hunter and sport shooter you get a friend for life with a Flodman. The unique construction offers several combination possibilities and with all it´s components an entire gun system: Shotgun-double rifle-combination. It is only to choose which. In spite of it´s low profile and elegant lines, the Flodman is a strong and robust, universal gun - effective, safe and good handling. Interchangeable chokes gives you possibility to choose the right choke for all situations. Standard Flodman guns are delivered with steelgray matted barrels which gives you no troublesome reflections. The gun is cocked with the top-lever which results in barrels beging "easy-opening". A much treasured detail when quick reloadings is needed. The action is designed so that the recoil absorbtion is of the advantageous - straight-line-type. As a result of the shooter feeling more comfortable and a second wellplaced shot can be fired more quickly. Combi barrels, which also suite earlier Flodman. 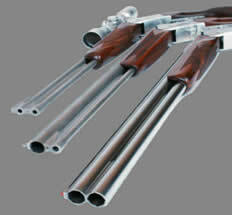 Double rifle barrels and titan shotgun barrels. All stainless steel construction, barrels, action frame and mechanism. Forget rust and corrosion problems. We also have special alloyes in details exposed to high strain. Extremely "low and elegant", in fact the lowest over/under ever made, even lower than some side by side guns. The Flodman is strong and robust, safe and good handling. The gun is cocked with the top-lever which results in barrels being "easy-opening" and it also opens up more than conventional guns, much treasured details when quick reloading is needed. A shotguns quality and long life expactancy depends very much on the interlocking system between the action-body and the barrels.Flodman has been constructed with bith extremely large and geometrically correct bearing surfaces. The action is designed so that the recoil absorbation is of the advantageous straight-line-type. As a result, the shooter is feeling more comfortable and a second well-placed shot can be fired more quickly. Interchangeable chokes gives you the possibility to choose the right choke for all situations. Chose lenght of longforcing cone. 1200 Bar Proof Approved for steelshot. Standard Flodman guns are delivered with steelgray matted barrels which gives you no troublesome reflections. Flodman is also available with polished barrels and nice engravings as extras. The for-end is always "firm-mounted" ans available in two models, game/sporter. The special Flodman ejector system with a special plunger coming into contact with the expanding shell, looking and releasing the extractor. The advantage is: A minimum of details and no ejecting when dry-firing. The easiliy reached and serviceable mechanism is also of a new construction. All the vital parts, trigger, shift-lever, sears, are balanced in its geometrical center, which gives a built in safety. The usual hammers are replaced with strongly dimensioned firing-pins which strikes the cartridge in "right angle". This enables also very crisp trigger-pulls and a outstanding fast lock-time of 2/1000 of a sec.